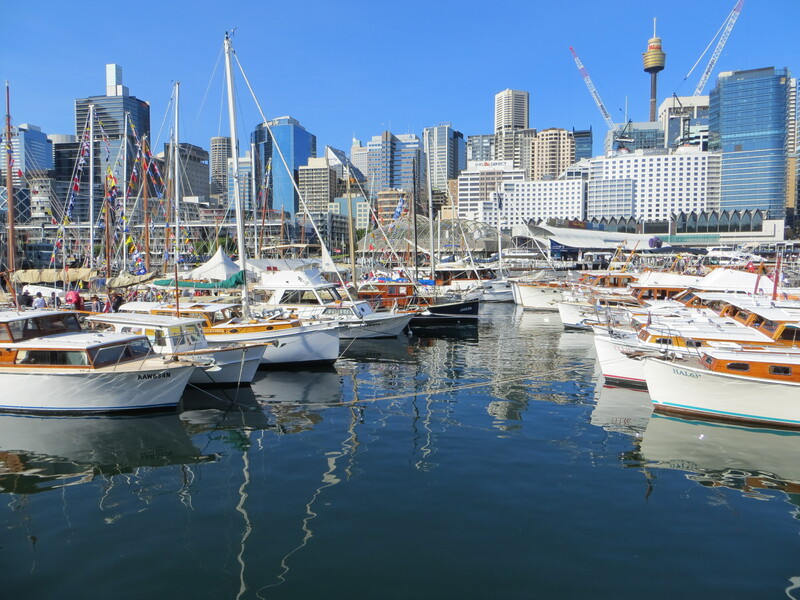 This could be my favourite trade show because there are so many beautiful boats to admire — ranging from delightful rowboats to sleek wooden sailing yachts to elegant power cruisers such as those from the Halvorsen’s boatyard in Ryde. 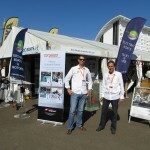 The show was well attended on the first day by classic boat owners and builders who showed strong interest in electrically powering their vessels. 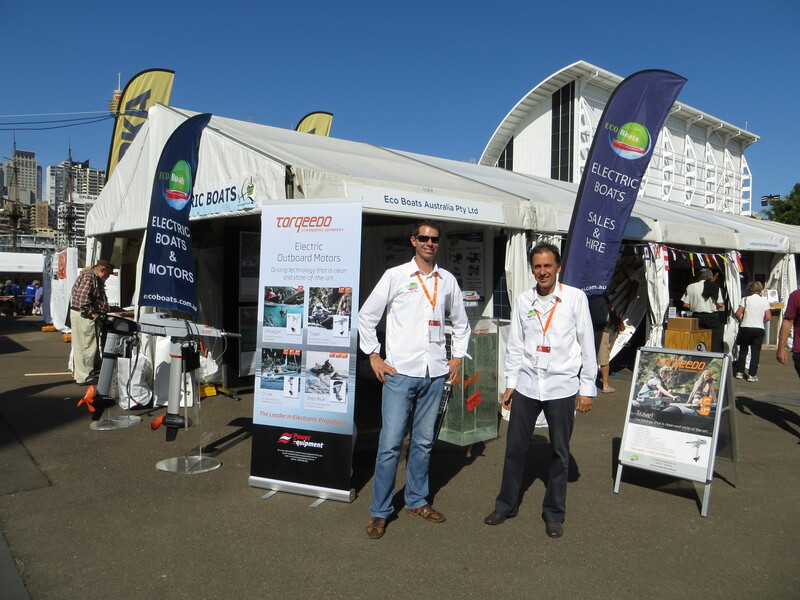 The weekend days also included lots of families generally interested in classic boating and yet not quite so passionate about building. 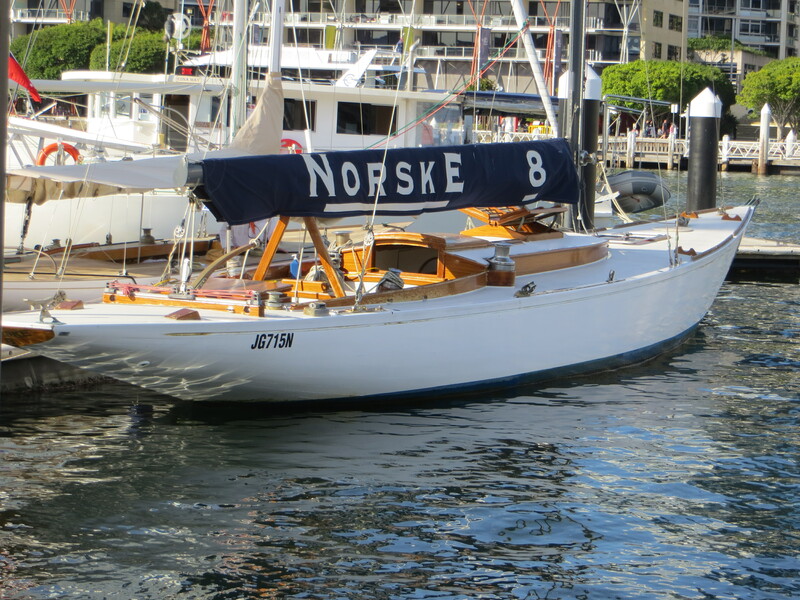 There were two classic wooden yachts, Norske and Scarab, that are electrically powered on display here. Scarab is a Halvorsen gaff rigged yacht and was launched in 1925 — she’s of spotted gum frames, kauri planking with an ironbark keel. She was restored by Charles Fitzharding and it was during this restoration after spending days cleaning the bilge with waterjets that he thought there has to be a better way than putting another smelly diesel back into this classic boat. This was the beginning of Charles’ exploration of electric propulsion and he installed a Lynch motor running at 24v together with some deep cycle batteries. This setup can push Scarab along at a comfortable 5 knots at full power. 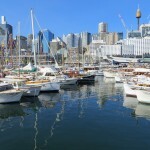 Charles was a the pioneers of electric propulsion in Australia in modern times and went on from there to import some Duffy boats from the US and fit out other boats with electric motors. 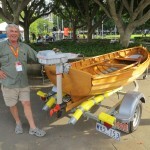 Charles was a key supporter of the establishment of Eco Boats by Steven Mullie in 2007 and provided a lot of the initial technical knowhow. 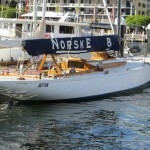 Norske is an international eight metre yacht launched in 1948 and built of Huon pine. She now has a 5kw Mastervolt electric drive, offering equivalent thrust to a 15HP diesel. 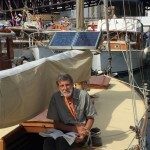 She has a set of AGM batteries and a Solbianflex solar panel to keep the batteries topped up when she is on her mooring. 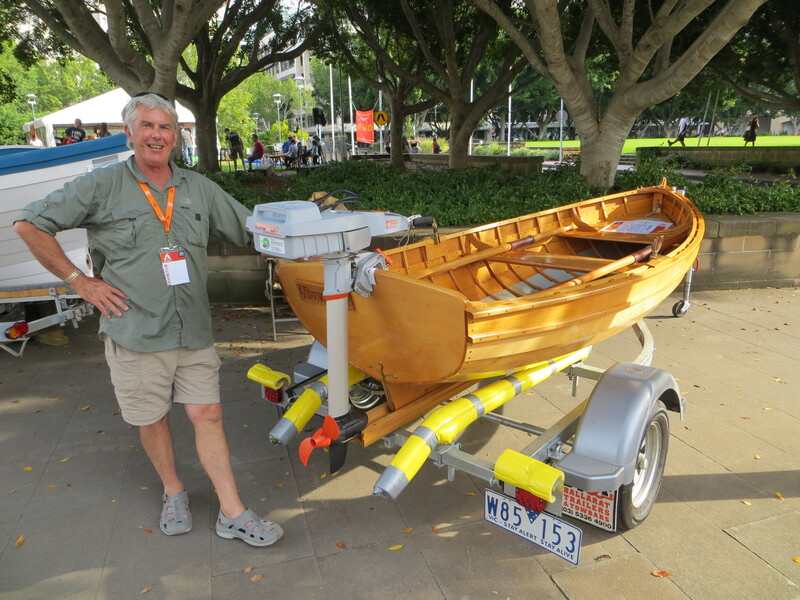 Philip Meaney had on display his beautiful rowing boat, Norma, and is planning a trip down the Murray River later this year. 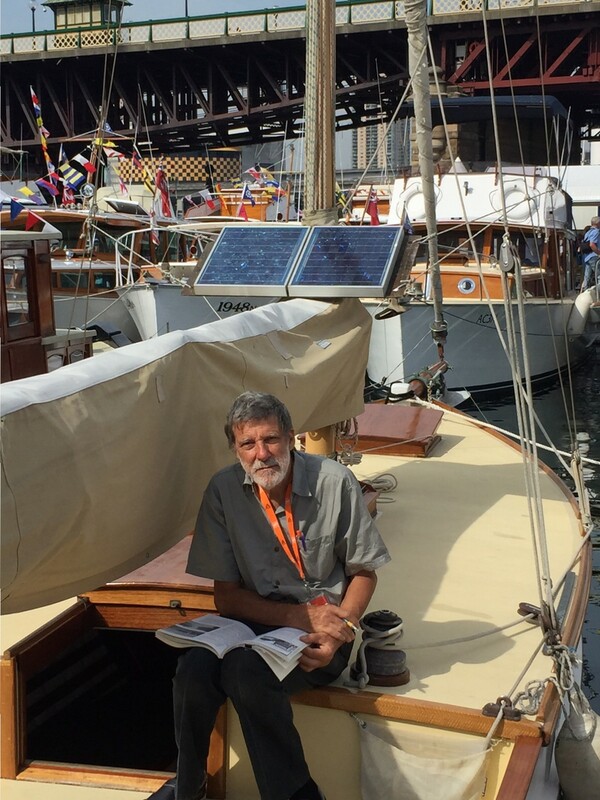 Philip purchased a 1003 and solar panel to help propel him in his journey down the river. The 1003 is a good match for such a rowing boat and when running at low power setting around 50 watts we expect it to be able to get all the energy it needs from a 100w solar panel. At this power we guess that Philip might travel at about 2knots, perhaps more. Philip is hoping for good winter snow to refresh the Murray during the spring melt and offer better conditions than are available now with about 600 miles of the Murray suffering from algae blooms. We’ll check in again with Philip in spring and given the good conditions he is hoping for, we will follow him in his trip down the Murray.